Bushy shrub 2–3 m high. Branchlets tomentose. Phyllodes inequilaterally narrowly oblong to narrowly elliptic-oblanceolate, straight to shallowly recurved, c. 10 mm long, 2–3 mm wide, obtuse and excentrically mucronulate, coriaceous, with 2 or 3 distant, tomentulose main nerves and with raised, anastomosing secondary nerves. Inflorescences 1-headed racemes; raceme axes 1.5–2 mm long, white-tomentulose; peduncles 3.5–4 mm long, tomentulose, with a basal, glabrous, round bract and an amorphous glandular mass opposite; heads globular, 4–4.5 mm diam., densely 30–40-flowered, presumably golden. Flowers 5-merous; sepals c. 2/3-united. Pods not seen. Known only from the type collection in an area NE of Wagin in south-western W.A. Gazetted a presumed extinct species in W.A. Grows in gravelly soil in Wandoo forest. A member of the ‘ A. flavipila group’ related to A. flavipila which differs in having commonly two-headed racemes and smaller heads, free sepals and golden pubescence. Near Wagin [precise locality withheld for conservation reasons], W.A., 1 Sept. 1923, C.A.Gardner 1504 (Forest Dept. no. 2004); holo: NSW; iso: K, PERTH. J.H.Maiden & W.F.Blakely, loc. cit. 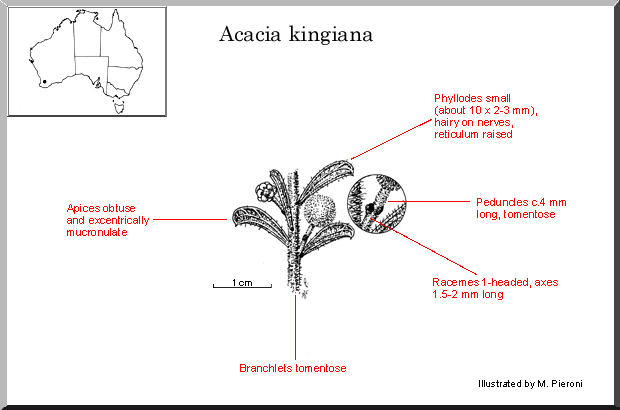 The information presented here originally appeared on the WATTLE CD-ROM which was jointly published by the Australian Biological Resources Study, Canberra, and the Department of Parks and Wildlife, Perth; it was produced by CSIRO Publishing from where it is available for purchase. The WATTLE custodians are thanked for allowing us to post this information here.